Dr. Linda Shanti's interview for her It's Not About the Baby Weight Summit! It’s Not About the Baby Weight Online Summit from Lindsay Stenovec on Vimeo. SIGN UP FOR LINDA’S FREE ONLINE SUMMIT TODAY! During pregnancy and postpartum, your relationship with food changes and your body transforms. This shift is challenging for nearly all new moms, but if you have a history of anxiety, depression, or an eating disorder, that adds another layer of complexity to an already difficult process. So, what kind of support do you need if you are in recovery as you transition into motherhood? Dr. Linda Shanti is a licensed clinical psychologist in private practice in San Francisco. She specializes in recovery from eating disorders, body image challenges, anxiety, postpartum depression, and new mom support. Linda is also a well-known speaker and author of the book The Recovery Mama Guide to Your Eating Disorder Recovery in Pregnancy and Postpartum. With 20 years of experience in the realm of compulsive eating, emotional eating, binge eating, bulimia, and anorexia, she is committed to helping women leverage expressive arts, mindfulness, and compassionate mirroring to support recovery in pregnancy and postpartum. On this episode of The Embodied & Well Mom Show, Linda joins us to explain the proactive approach she took to get support during her own pregnancy, discussing the way her anxiety presented as irritability, anger, and hypervigilance. 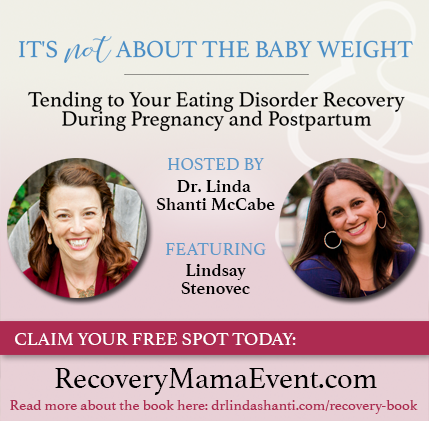 She shares her experience with both food and body image during pregnancy and postpartum and describes how she supports women in decoding the myths around ‘getting your body back.’ Listen in to understand Linda’s approach to working with new moms in recovery—and learn to quiet your overdeveloped self-critic in favor of self-compassion!